In today’s episode, Tim and Abby tackle the topic of career education, and what the role of art can be when it comes to career and technical ed. Listen as they discuss whether CTE helps or hurts the art room (maybe both? ), how to embrace CTE and use it as an advocacy tool, and how art can lead the way when it comes to teaching skills for the future. Full episode transcript below. Is There One ‘Right’ Way to Teach Art? Tim: Welcome to Art Ed Radio, the podcast for art teachers. This show is produced by The Art of Education and I’m your Host, Tim Bogatz. Now there has been a growing amount of discussion lately around a more career-centered education system, where students are taking more classes to get them involved in a particular career path. And it’s a topic that quite a few people have asked me to do a podcast on. So we’re going to dive in today. And this isn’t a topic that I know a lot about, but there are a few questions that I definitely want to answer in the course of the episode today. So what is career and technical education, and more importantly, how does it affect us, as art teachers? Obviously, it’s going to be a little bit different for everyone because our situations as art teachers vary so much. But if I can summarize just a little bit. A lot of schools are moving toward like we said, that career-centered education system, where students have to decide early on, sometimes in middle school, seventh, eighth grade, essentially what career pathway they want to take. Then they are, like I said, essentially put with like-minded individuals, and they take classes to get them on that career path or on that track. And it’s not necessarily providing the college-bound mentality that we hear so much about. But it’s supposed to have students look at career options and what’s out there for them beyond high school. And as a result, I think art teachers really have to rationalize a little bit about what we’re doing. What am I teaching my students for the future and what skills and concepts are they learning that they can carry on to future careers? And I think the most important question if we start judging our art classes on how well they contort themselves, or how well they fit in with a career education model, isn’t that doing our subject a disservice? It’s a lot to think about and a lot to talk about. So I want to bring on Abby Schukei today, who has a little bit more experience than I do here, and we’re going to kind of work our way through some of these questions and these ideas. So let me go ahead and bring her on now. All right, I am joined now by Abby Schukei. Abby, how are you doing? Tim: Good. I’m excited to have you on to talk about this because this is something that you know a lot more about than I do. But I think it’s worth discussing. We’re going to talk all about career and technical education. So to begin, if you can just give us a good explainer. Like if people are like me, they don’t know much about career and technical ed. Can you talk a little bit about how it’s influencing our school system, and what that can look like, what career and technical ed can look like in your own classroom? Abby: Sure. So many, a lot of high schools and even some middle schools have really kind of started to adapt this CTE education. And what it is, is it’s really looking to get kids in the mindset of what kind of career path they would like to take. So I think there’s some really good things about it, but there can be kind of some barriers with it. But ultimately, it’s looking to have students look towards their future, what are they going to do? And I think in the past, a lot of times, it’s been really college-bound, college-centered, let’s focus on going to college. But for all of our students, that’s not a reality. Abby: And so this program kind of helps take some of those more technical skills and kind of helps them see what the next step is for them to reach that career. Whether it is college, maybe it’s going to be some other certification or training of some sort, but it’s just ultimately going to help them look to what their future career might be. Okay, so that’s a good explanation. But let me ask you this, just looking at it kind of big picture-wise, I feel like art teachers are always fighting for our programs, to justify what we do. Tim: Do you think that maybe a move toward career and technical education and a focus on it can help us? Or, do you think that hurts us in the art room? Abby: I think you can do a little bit of both. And I’m going to say maybe why I think it could hurt the art room to start with. A lot of the times when students are getting into this career technical education, they have to select a field of study, or a pathway. Just kind of like you would if you were declaring your major in college. And so as they go to do this, they are kind of set in these classes that they have to take. So let’s say they want to take this architecture mindset, or they want to be science, they want to be a doctor, they’re going to take these classes that are all going to help them become in the medical field. So they’re maybe not having as much exposure to those things like the arts, or some of those more humanities classes, and so they’re not becoming a well-rounded individual. Tim: Yeah, and that seems super early to me. Abby: It’s challenging and it’s hard, too. Kids get a little freaked out, “I don’t know what I want to do.” Or they take a career test and it’s kind of based off of that, and they’re like, “I don’t want to do that. Like I don’t want to do that.” So I mean, I understand like how it can really benefit students as far as trying to get them to look for the future, but I think sometimes, some of those science kids and math kids might be swayed away from taking those classes in the arts, even if they really love it because their career path, their pathway is not physically leading them in that connection. So I do think it can kind of hurt arts programs in some ways, but I think it can definitely help them, too, because there are so many lifelong skills that art teaches. It really does. Things like getting dressed in the morning, color, like there are things that are just lifelong skills like that, but I think one of the most important things that it teaches is creativity, which because I’ve had to do quite a bit of work with my school with the career education. And we recently had this meeting with all these CEOs from around our school area, and I, of course, was chosen to sit with some guy, some CEO of a car company. Abby: But we teach them so many other things. There are technical skills in there that you’re going to teach them. And so I think it’s all about how you present your art room. Are you teaching STEAM concepts? Project-based learning, what kind of, what are you doing in your classroom that is really going to see and look as a benefit to students as they pick their career path in the future? Tim: Yeah, so let’s dive into that a little bit more because you’re saying a lot of really good things about how art can affect things far beyond our field. So can you talk a little bit more, not just about creativity, but more about other skills that the arts can teach? And then secondly, how do we get people to realize how diverse art can be? Like how many different skills kids can learn through the arts? Like how do you advocate for your program in this type of situation? Abby: Sure. Well, I’m going to give you an example here. So I have a twin brother and he is very left mind, left brain creative. I’m very, very right brain creative. And he actually went, we went to school at the same time. He went to, he was in the architecture program and I was in the art program. And it’s kind of funny because, obviously, he was always better at math, and numbers, and straight lines, things I was not. But it was actually kind of funny because of our first four classes that you had to take before you could actually take a studio painting class, or a studio drawing class, kind of your fundamental classes, you were mixed in with architect majors, the architecture program, interior design, and then your art students. And so it’s amazing to see those like such, I know they’re both creative, but in such different ways. And so in that environment, I think it really shows how those skills matter. Whether just, no matter what kind of thinker you are, it really is important to have exposure to them. And so that’s how art teachers can benefit from that because they are teaching skills that are going to eventually help in other careers, no matter what they go into. One of the ways that you can really … One, you need to assess like what is needed in the future? What are things that are going to be needed right now? 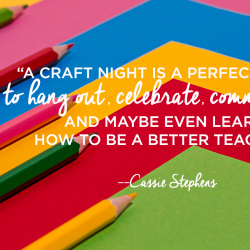 And figure out a way how to incorporate them into your classroom. So, obviously, technology is huge right now. I know some art teachers don’t really like to incorporate that into their classrooms, but there’s so many different ways. Whether it’s even low tech, simple things like coding. I do a lot of coding with my students because computer science is huge. Like those are going to be demands in careers, and I am the only person at my school that is teaching those things. I’m just the art teacher, in that regard, but kids are coming. They’re able to take those more logical, mathematical, all of those things. And actually apply them in a creative way, and in a different way, which shows, “Wow, like art is teaching so much.” So find something that nobody else is doing in your school and do it. Tim: Yeah, I think that’s really good advice and I think it may take some creative thought to figure out what exactly what’s new, what’s different that you can do in the art room. But that kind of gets me into my next question because I want to ask. How much does career education kind of influence what you’re teaching? Like do you feel like you’re obligated to teach some of those specific skills or those specific concepts that nobody else is teaching? Or, have you just kind of kept doing what you’ve always done and all of those ancillary benefits, just kind of develop naturally from what you’re already doing? Abby: I think some of them have kind of naturally evolved from what I already do. But I wasn’t necessarily aware of it. So I’ve been a little bit more conscious with that. Of, “Okay, how could I maybe take this up a level to kind of show the significance of it?” And I think there’s a lot of times when we’re teaching things that we think, we don’t stop and like talk about an art career all the time. We kind of think it’s implied, but our students don’t get that always. So I think when you can take the opportunity to kind of think about that. Whether that’s kind of putting it into a video game, or people who create video games have to know this skill. So kind of put into things that your students like. Whether it’s a t-shirt that they’re wearing, talking about graphic design. 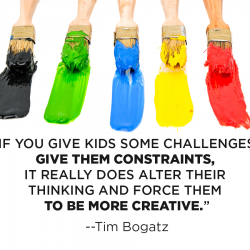 There’s so many ways that you can kind of put those ideas into your students. You just have to remember to do it and just don’t always think that it is implied. Make sure to actually take the time out and discuss how that could actually be used as a future art career. Tim: Yeah, I think that’s a really, really good point. Because I just think about like making things stick for kids, and it’s difficult even when we focus on it. But if you’re not paying attention to careers at all, like there’s no way for kids to realize that. And so, yeah. I think it is an important point that you can bring that into your room. So let me just ask you this though, like do you think, if we’re looking overall big picture at career education, do you think that art teachers should embrace the idea of career connections? And, I guess as a follow-up to that, going back to how we advocate for our programs. How do we make sure that administrators make us, how do we make art programs part of the discussion? Tim: Yeah, that’s really cool. And I think, you talk about how sometimes we need to kind of rationalize what we’re thinking, what we’re teaching, what we’re doing. And can you just kind of get people started with that? Can you maybe just talk about two or three things that you do in your art room, kind of beyond the coding idea, but like what else are you doing in there that lends itself to career education? 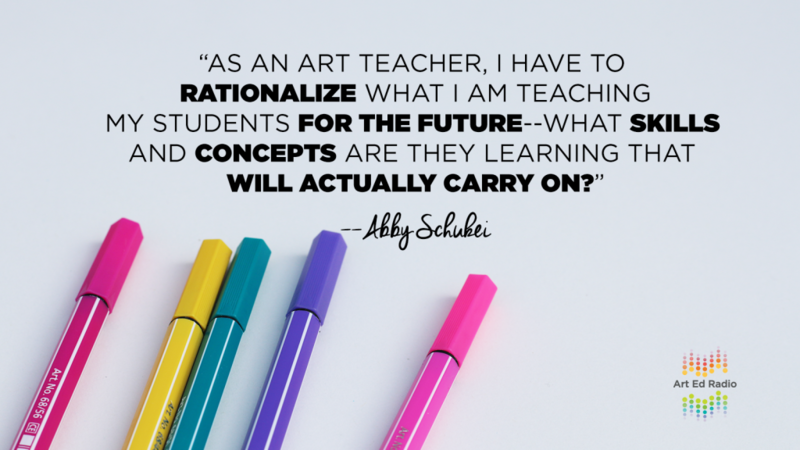 What else are you doing that prepares kids for the future, and kind of can, what skills go across disciplines that we can focus on in the art room? Abby: I think whenever you’re able to incorporate something like a different subject area, like science. Showing those students in a different way how you are learning, how you can take the same thing and learn it in a different way. I think that’s really important. Another one, like math. Kids don’t know how to measure with a ruler. Abby: I just did this huge color project, based off the Artist, Kristin Farr, and she … We use rulers like crazy. And I had a kid, I had a kid come up to me, and he was talking about his industrial tech class. And I was like, “Okay, guys. We’re going to have to do math. We’re measuring.” And he’s like, “All we do in IT is measure, measure, measure. We just talk about rulers.” And he like threw this big fit about it. And then as we started getting into the project, he couldn’t, like had a difficult time like figuring out where a quarter-inch was. I kind of went up to him and I was like, “Yo, Brian. Like I thought you just talked about rulers all the time.” He’s like, “We do.” I was like, “But, you still don’t know how to use it.” He’s like, “Yeah, I know.” So it doesn’t have to be huge, so it doesn’t need to be big coding things like that. Just kind of those small, little things that you can intertwine. Technology, it can go like, if you are able to team up with a local company, something like that. We have done that, where we’ve teamed up with a local company that was throwing an event, and they wanted to have us design a Snapchat filter, a geo filter so that they could use it. So that’s something that’s really applicable to my students and they’re actually creating something that is going to be used as a community. So it’s kind of, if you’re able to give those real-life experiences in that way, that’s going to go a long way. Tim: Awesome. That is, yeah, some great ideas there and I appreciate you sharing those with everybody. Because like I said, I think this is something that we probably need to talk about a little bit more, so thanks for coming on and giving us some insight into what you’re doing. Abby: Yeah, thanks for having me. Tim: Okay, a big thank you to Abby for lending some of her experience and talking through some of those ideas with me. Now before we close, I want to talk to you about Art Ed PRO. 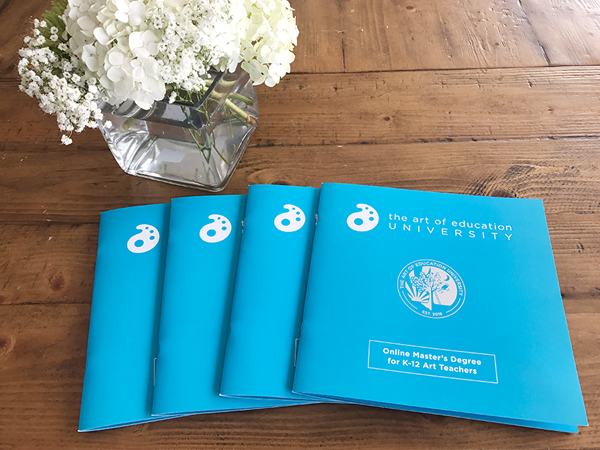 Art Ed PRO is on-demand professional development, with video tutorials, downloadable handouts, and all kinds of other resources to help take your teaching to the next level. With three new learning packs being released earlier this month, the library now has 80 learning packs, which should cover just about everything you need. But we’re going to keep filming, we’re going to keep recording, we’re going to keep putting out more of them for you. October’s new packs include Peer Feedback by Kim Jensen, just an awesome facilitator from San Francisco. I recorded a pack on surviving your first year of teaching high school, so if you know anybody out there who needs a little help with that first year, make sure that you point them our way. And Nick Hahn has a pack on monoprinting, as well. And all of these are awesome learning opportunities that you and the people you know should be taking advantage of. So make sure you check them out at theartofed.com/pro. Now I really like what Abby had to say toward the end of the conversation there, where she talked about how she wasn’t necessarily sold on the idea of career and technical ed. But she was able to adapt to it because she realized that’s what was going to be best for her program. It’s not anything new for her, it’s more of a subtle improvement on what she’s already doing. And as she’s improving that, she is also able to turn it into an advocacy tool. And then her administration, her school board, her community are all kind of buying into the awesome things that are happening in the art program. And that shows art in a better light. It puts your program in a better place. And she talked about how it wasn’t difficult for her to get there. 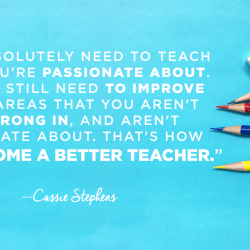 You can look at what you’re already teaching and just look at how you can improve it. And just ask yourself, “How is this going to benefit my students, both now and in the long-term?” Which I think is something that we should all probably be doing, anyway. 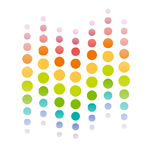 Art Ed Radio is produced by The Art of Education, with audio engineering from Michael Krocker. Thank you, as always, for listening. We’ll be back next week with a pretty fun episode, I think, all about the best Halloween costumes for art teachers. So Amanda Hein, our Senior Editor, is really passionate about all of her Halloween festivities. So I think it should be an enjoyable episode, and you’ll get some ideas if you’re one of those costume procrastinators who likes to wait to the last minute. So we will talk to you then.